It’s happening again. A prominent figure of the political Right is being accused of preying on women and betraying the ideals of the conservative movement, yet rather than confront him, conservatives are rallying to his defense. “It’s a vile conspiracy of the Left!” they cry. These conservatives have a point. Certainly whenever a conservative bleeds, the media sharks circle and a feeding frenzy ensues. The Left was thrilled when the New York Times revealed that Fox host Bill O’Reilly was the target of numerous sexual harassment complaints and that Fox News had paid millions to settle those cases. The Left-leaning, Soros-backed Media Matters then quickly capitalized on the news, launching an “advertiser education campaign,” resulting in 80 advertisers dropping O’Reilly’s show. Not surprisingly, O’Reilly yesterday was forced out at Fox News. Certainly, times are changing at Fox. And with Rupert Murdock’s son, James, at the helm, the network may shift more toward the middle politically, or even go Left. The revelations about O’Reilly may have just been a convenient excuse for James to do what he was inclined to do anyway. But is O’Reilly’s demise really the result of a liberal conspiracy? And does attributing his fall to a conspiracy help or hurt the conservative movement? Was O’Reilly the Target of a Conspiracy? Without access to sealed documents, no one can know for sure if O’Reilly is guilty or innocent. O’Reilly maintains he did nothing wrong. But generally speaking, where there’s smoke there’s fire. Certainly, the fact that Fox News paid $13 million to settle sexual harassment complaints against O’Reilly suggests that these women had legitimate cases against him. Also, the fact that five women independently brought suits against O’Reilly is damning. If someone had evidence that these women colluded or were enticed by the Left to bring these allegations, then I would consider that this scandal was the result of a conspiracy. As it stands, though, these latest allegations seem to confirm what other women at Fox have alleged – that the network is rife with misogyny, corruption, and hush money. More than two dozen women accused Fox News CEO Roger Ailes of sexual misconduct, resulting in his resignation in July. Unfortunately, though, now the Right is doing what the Right does – at least since the emergence of Donald Trump. We’re crying conspiracy and fake news. And rather than helping the conservative movement, this reaction is seriously undermining it. This scandal is likely the result of Bill O’Reilly behaving badly. But he’s been behaving badly for a long time, rudely talking over guests, calling them names, and rarely considering any view but his own. He even mocked Rep. Maxine Waters (D-Calif) for her hair, saying he couldn’t focus on her comments because he was distracted by “the James Brown wig.” I’m no fan of Maxine Waters, but that comment was stunningly inappropriate, not to mention racist. O’Reilly’s rude and demeaning behavior hasn’t been limited to liberals either. He once said Christians who oppose gay marriage for religious reasons need to do more than just “thump the Bible.” Then when talk show host Laura Ingraham took him to task for his comments, he berated her on-air. Conservativism is about conserving the values on which this nation was founded. These are values rooted in the Judeo-Christian belief that every human being… is made in God’s image and should be treated with dignity and respect. Even before allegations of sexual harassment surfaced, I was embarrassed that such a boorish human being would serve as the poster child for the conservative movement. Yet conservatives, by and large, were glad to have this pit bull on their side. After all, he was attacking the evil liberal establishment. The meaner he got, the more ratings surged. Conservatives should have called O’Reilly to account long ago. After all, conservativism is about conserving the values on which this nation was founded. These are values rooted in the Judeo-Christian belief that every human being – black/white, male/female, conservative or liberal – is made in God’s image and should be treated with dignity and respect. Do we really believe that no one holding our political views is capable of evil? I’m beginning to think we do. I wonder sometimes what it would take for many conservatives to believe that one of their own has done something wrong. As President Trump bragged during the election, “I could stand in the middle of 5th Avenue and shoot somebody and I wouldn’t lose voters.” Friends, that kind of cultish following is frightening. Conservatives are used to being a persecuted minority and fearing the evil forces outside their movement. But now that the tables have turned, our primary threat may be the evil within our movement. As Senator Cory Booker (D-NJ) wrote, “(M)ost (civilizations) do not fail simply due to external threats but because of internal weakness, corruption or a failure to manifest the values and ideals they espouse.” I may not agree with Booker’s politics, but he’s spot-on with this observation. Republicans now control the White House and both houses of Congress. This time in history is reminiscent of the famous “Contract with America” days when Republicans gained 54 House seats and nine U.S. Senate seats under House Speaker Newt Gingrich’s leadership. Unfortunately, though, conservatives squandered that opportunity to lead as Gingrich succumbed to a scandal of his own making. Now more than ever, conservatives need to uphold their ideals, not idealize their leaders. 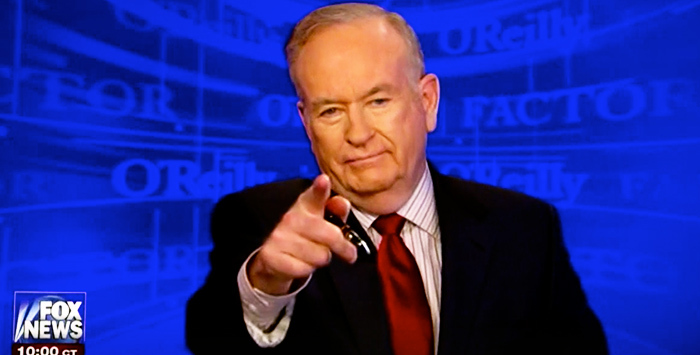 If Bill O’Reilly or any other leader betrays conservative values, then we need to object. And we need to evaluate what the media presents objectively, not continue to cover our ears and cry conspiracy. Thanks for the well reasoned post Julie. I could not agree with you more. As followers of Christ, we need to stop aligning ourselves with popular figure heads. Agreeing with someone should stop at that instead of lifting the person onto a pedestal. We are all too familiar with the dangers of doing this. We should be pursuers of truth and defenders of the oppressed rather than followers and worshipers of men. The object of our worship and our desire is singular and personal. Thank you Julie! I was so glad to see your well-reasoned and civilized post. Our example and leader is Jesus Christ and our values are to align with His. I think we need to spend more time getting to know Him and what He was and is like. He certainly was not arrogant, but meek! He warned us to beware of religious leaders (who were also very political). We certainly need to beware of placing our trust in political personalities as well. We do well to remember that the Sadducees and Pharisees disagreed with each other but they cooperated in crucifying our Lord. Agreed…but how does one determine what is truly being “presented objectively” in its entirety? There are many players and layers…and lots of money in play. Your thoughts on examining threats from within provide excellent insight, as always. However, I felt O’Reilly was not an appropriate example of that insight because you were embarrassed of him already. I think you would have to be a supporter or demonstrate that you have interviewed his supporters thoroughly enough to find their hearts (not just reading the media hype) before you could speak to whether they are being cultish and need more self-examination. I am blessed to not have cable TV, so I couldn’t speak on this topic either. I am no Bill O’Reilly fan. Other than I most enjoyed his Killing Books. Especially Killing Lincoln and the Rising Sun. He is a known Catholic, so I suppose I can possibly understand his dis like for Evangelical Christians. From what I know of O’Reilly is that he is Single? Divorced and never re-married? I think. No way to know what he did on the actual accusations. But, from what I read it is simply exchanging words. Granted, maybe he should be so brash and demanding and maybe ask Women for attention in a maybe more respectful manner. It just seems none of the accusations seem to be more than saying something like Nice Rear, Nice Breasts, Nice Legs etc. If even that.and none of the accusations seem to be more than a maybe light touching? Granted, probably should not do that. I just wonder if more than a Warning or Admonishment is Justice? After all he supposedly is Single? Maybe he actually liked those Women and wanted to give those Women those $? Also on another issue. Some of Fox News Women need to wear longer Skirts and Dresses? It might help restrain some men giving them too much sexual attention? Just saying. There is a lot more to the accusations that what you suggest, sgtjdusar. Google this story and read about the 1st woman 13 years ago and the comments Bill supposedly said to her on the phone (which she taped recorded). Very sexual, rude, illegal, etc. Read about how he tried to get custody of his children and lost. One of the reasons the Fox news women wore suggestive clothing is because Roger Ailes required that dress code. O’Reilly used the weapons of this world to fight his on-air battles and they seemed to serve him well. But one does not get to be a tall tree by cutting down the rest of the forest. The wise know it is better to take refuge in the Lord than to trust in man or princes. Sad, just sad. I grew up with 3 brothers, O’Reilly could’ve been one of them. Is he a perfect man? No, I have not met ONE outside of the ONE in the Bible, Jesus Christ. I so appreciated O’Reilly’s candor, his unapologetic refusal to ‘air’ stories w/o legitimate verification, his ability to keep to the point with his guests … you got the point. Uncanny that when 20 Century Fox ( Hollywood) said they were cutting ties w/Fox news, Bill was ‘given notice’. Surprised ? Absolutely not. I’m ready to pull the cable – ‘Caitlyn Jenner’ will be ‘featured’ on Tucker this weekend, who needs one more left-leaning news outlet? Praying Jesus returns SOON.